The Veteran must provide either a U.S. Uniformed Services ID Card, form DD-214 or current leave and earnings statement w/photo ID, dog tags w/ a picture ID, or photo of them in uniform. 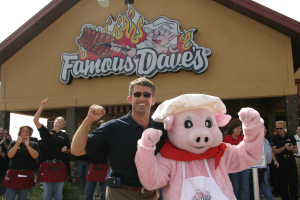 There are four Famous Dave’s restaurants in the Valley including Chandler at 3250 West Frye Road; Peoria at 16148 North 83rdAvenue, SanTanVillage in Gilbert at 2206 E Williams Field Rd and Mesa Riverview in Mesa at 1011 Dobson Road. Go to www.famousdavesbbq.com for full offer details. This entry was posted in blog and tagged AZ, CHANDLER, FAMOUS DAVES, free, GILBERT, military, peoria, phoenix, SanTan, veterans. Bookmark the permalink.